Sierra Salmon Fuchsia has narrow blue-gray leaves and produces profuse salmon-colored flowers in late summer or fall when many other flowering natives are dormant. Upright growing from 8"-2' tall and equally wide. Epilobiums are recommended for casual or informal gardens. Plant on slight slopes among rocks, in dry stream-beds, against rock walls or in rock gardens. Good for erosion control and fall color. Cold hardy to 10 degrees F. They are beloved by hummingbirds. 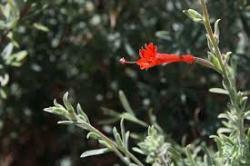 We recommend cutting California Fuchsia back very hard in the late fall ready for flush of new growth in the spring.